Processing studies are used to support a proposal for a maximum residue limit (MRL) for a raw commodity and in some cases for a processed commodity. There is an increasing need for information about the effects of storage, peeling, washing, cooking and food processing on the fate of agricultural and veterinary chemical residues in foods and animal feeds both from a regulatory and public health perspective. In some situations, processing studies provide a more realistic estimate of dietary intake of residues from the use of an agricultural or veterinary chemical. However, for many pesticide products no data will be required since residues in raw agricultural or animal commodities are not significant or are not detectable. In such cases, MRLs in the processed foods are covered by the entries for the raw agricultural or animal commodities. This guideline is intended to be in harmony with those used in other jurisdictions, such as the European Union, the United States and Canada, where processing studies are also conditionally required, and with Codex. Data from relevant studies conducted in other countries, along with appropriate argument, will normally be acceptable for Australia. Completed processing studies conducted overseas should be submitted with an application for registration. This guideline gives only general advice on when and what type of processing study may need to be carried out to support an MRL proposal. In some situations, an applicant may need to produce a protocol in consultation with the APVMA. Detailed information about the conduct of processing studies is available in the guidelines issued by Codex, the European Union, the US Environmental Protection Agency and the OECD. when the commodity contains residues above the limit of quantitation and processing studies are mandatory (such as in the case of wheat). Processing studies will generally be required when significant (greater than 0.1 milligrams per kilogram) residues are present in the following raw commodities: cereals, oil seeds, citrus, grapes, apples, potatoes, dried fruit and sugarcane. there is adequate evidence that residue levels in processed foods and feeds will not exceed the level in a raw agricultural commodity. 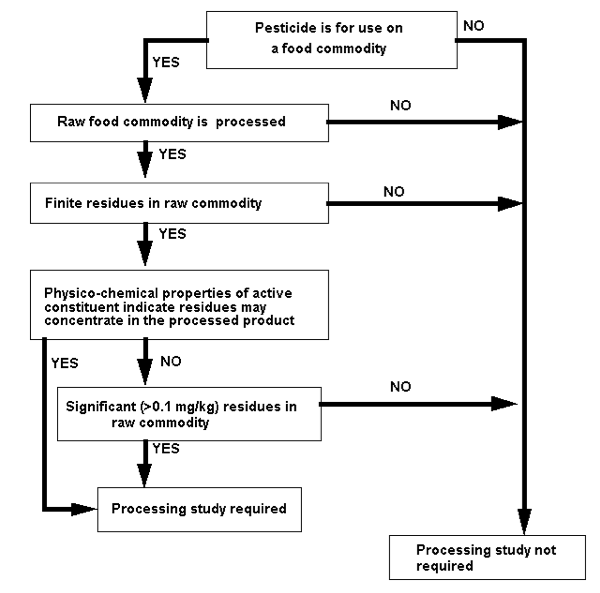 The process for deciding whether a processing study is required to support a proposed MRL is summarised in Figure 1. You should use the decision tree in conjunction with the explanatory notes that follow. Processing studies should only be conducted on commodities containing weathered (aged) residues. Using fortified samples is generally not acceptable unless the raw commodity residue consists entirely of a surface residue. If processing results in alteration of the residue, a radiolabelled processing study to determine the nature of the residue in the food or feed should be carried out on one of the major food-processing procedures that involves the use of heat. You do not need to carry out a radiolabel study on every crop or crop group. When designing a residue program, you should consider all raw commodities that are processed. Lists of commonly processed animal and crop commodities that should be considered are listed in Tables 1 and 2. If you are in doubt about a particular situation, you should consult with the APVMA before conducting the study. 1 If it is likely that a higher residue will be present in refined oil than in raw oil, studies should also be conducted on the refined oil. 2 If the label contains a wide range of fruit crops, one study containing a fruit juice (eg apple), a preserved fruit (eg peach), a cooked fruit (eg peach), a jam (eg strawberry) and a dried fruit (eg prune) will normally be sufficient. The number of studies you need to conduct depends on the use pattern proposed and the number of crop and livestock species involved. Data should be developed for representative foods. One study per crop or animal or no more than two studies per crop or animal group is generally sufficient, although if the processed products play an important part in dietary intakes additional studies may be required (if in doubt, consult with the APVMA before conducting trials). If the raw commodity undergoes a number of processes (as in the case of cereals, for example), the initial major primary processed products should be examined first (flour and bran, for example). You only need to conduct studies on secondary processed and cooked products if there is reason to believe that residues in those commodities could be higher than those occurring in primary processed products. If a number of similar crops are included on the label, studies on one representative from each crop group are usually acceptable. If the label contains more than one animal species, data on one species is usually sufficient. Studies conducted overseas to determine processing factors will be acceptable if the processing methods are similar to those used in Australia. Normally the processes and cooking techniques used in Australia are not significantly different from those used in Europe and North America. The technology used in processing studies should correspond as closely as possible to the actual conditions in common usage (in the home or commercially). Storage for extended periods should be considered as a processing practice. If more than one process can occur, data should be produced for the worst-case situation. Studies using every conceivable type of processing and cooking are generally not needed, but a limited number using typical conditions is desirable. recognition of significant alterations in residues. The appropriate MRL can normally be set by multiplying all available raw commodity results for the crop or animal by the relevant transfer factor (from the processing study) and the estimated residue levels evaluated in the normal manner. A full laboratory report including all relevant data should be written using the standard format for residue reports (refer to the Reporting of residue trials guideline). The report must include a full description of the processing practice used.